We’ll have a few quick news bits, then dive into a tournament report from Raliegh, NC on 12/17/16, the first team tournament featuring your two esteemed bloggers working as a team! -First, a couple of weeks ago Aaron Daarland released a plan to alter the rate at which Malifaux Errata would be released in the future, and brought out the January 2017 Errata. These changes included changes that players have been asking for (in some cases) for a while now. Austringers getting their ranges reduced I assume most players are ok with seeing, as well as Rotten Belles having their cast brought down into only very good ranges rather than ridiculous. Daydreams got a little softening as well. Some other models got buffed. Go check out the file. I’m not a great crunch guy, but I might go through and write up a more in-depth breakdown later. -Shortly thereafter the new Gaining Grounds 2017 document dropped. Schemes were shuffled some rules changed. I’ll probably save an in-depth breakdown for its own post, but you can go check it out here. And now, on to the tournament report! A few weeks prior, Jon had asked me if I wanted to team up with him for the Treacherous Allies tournament at Atomic Empire games store in Durham, NC. 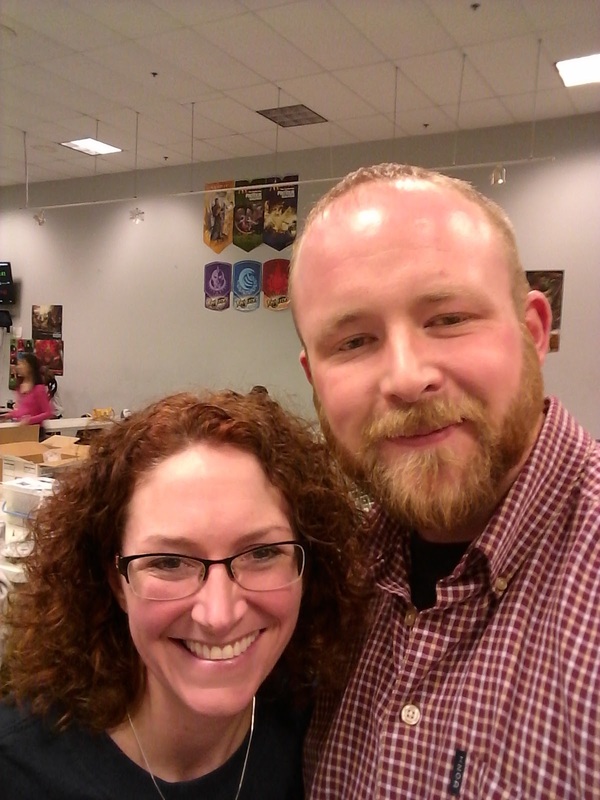 This was part of the program organized by the Southeastern Malifaux Players Group of some renown, which is led by the lovely and, of course, sassy Sasslady herself, Dawn McCormack Plunge. If you’re in the area and can go check it out, Atomic Empire is worth the trip. I’m a bit of a bumpkin, but its easily the biggest game store I’ve ever visited. They have snacks. They have a bar. They have more games than you’ve ever seen. Go check it out. The format for Treacherous Allies was, as I understand it, fairly standard for doubles tournaments. Each player on a team builds a crew with a master and 35SS each round from the same faction. Your models are considered friendly to each other. It’s not balanced and it’s not meant to be. Weird stuff happens in these types of games (more on this later.) You pick who is going first and second in your team every round and alternate activations. So, if one team has players A and B and the other has players 1 and 2, you could go A,1,B,2 in one round and could switch it up to B,2,A,1 in the next. So, basically you have a 70SS crew with two masters and two brains trying to pilot it. What could go wrong!?! We decided to go with Ten Thunders as they are Jon’s jam and I know Lynch fairly well. Our team was team “Let Me Know When You’re Finished Ten Thundering,” after a sentiment expressed by one of Jon’s opponents after much bewildering tossing of upgrades and various Asian themed nonsense. Dawn was of course thrilled to have to read it out every round. The general themes that came into our games every round revolved around our two halves complimenting each other rather than directly synergizing. Basically, McCabe was there to make something like the Dawn Serpent have reactivate with a super cool sword and the Terracotta Warrior buffing it to protect it from damage. Meanwhile, Lynch would be doing Lynch things, and Promises was there to make Hungering Darkness and any other Enforcers with upgrades we brought in work even better. And Jon's side would have Sensei Yu so he could use Lynch's Mulligan, giving both crews the ability to use it. Rd. 1 Interference/Flank Deployment/Search the Ruins, Leave your Mark, Exhaust their Forces, Detonate the Charges, and Convict Labor. Battle in the Bayou: Moments after a very ill-fated charge action. 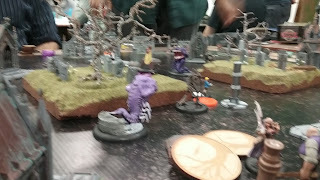 This round we played against two men named Jon playing Team Spidercide (Arcanists) We were building to exploit the Strangemetal Shirt and the toughness of Illuminated and Depleted, tossing the shirt on one of them to pass out Armor +2 to everyone around them with the Black Flash reactivate from McCabe. Seemed like a pretty good game plan at the time. Our opponents were bringing Ironsides with a cadre of the Oxfordian Mages and an Ice Dancer and Ramos with Joss, Howard, and…some Howard things? I don’t remember. We took Search the Ruins for a bit of counter-play and Detonate the Charges because why not. It’s Detonate the Charges. When I say we HAD a battle plan, what I mean is we had one for the first round of the game or so. We had also planned on tossing the Torekage the sword from McCabe so he could use it with his “Works Best Alone” + flip to dish out some hurt, before giving the designated Illuminated the Armor and Reactivate. The Illuminated did his bit, put out his bubble of armor, and the pack moved up. Ironsides, Joss with all the Oxfordian Mage buffs, and the mages themselves mean-mugged our pack of drug-addled freaks over a hill. Meanwhile, the Ice Dancer and the Torekage faced off on the side of the board. I have to imagine that looked like a Crouching Tiger style dance-fight. Would make a cool fan film. Where it all went wrong was when we won initiative round 2 and sent our Illuminated charging over the hill to try and get a cheap kill on Ironsides. We hurt her badly, but underestimated the damage Joss was going to do back to us, as well as the fact that one of the buffs from the Mages made him immune to Brilliance so Lynch couldn't just run up and delete him. We threw everything we had at the Arcanist firebase, but our forces withered under Joss's electrical axes and a storm of Furious Casting. Meanwhile, the Ice Dancer and Torekage mutually dropped detonate the charges markers on each other. Huggy engaged Howard and killed him before he could do too much damage, but Ramos then flooded Huggy with Spiders, effectively neutralizing him for the remaining turns (and allowing them to score for Exhaust their Forces. Whoops.) McCabe moved to stop the Joss-gernaught that was coming for us (or at least hold him at bay) but we realized we were in trouble going into turn 3, which the clock told us would be the last turn. So, time to start being the dirty criminals our faction is. We gave up on whittling Joss down (we almost got him, but were 1 AP short and he reactivated and healed,) and instead focused on objectives. The Torekage dashed into the middle along with Lynch to throw down some quick scheme markers and to delete the now assembled Spider Swarm, which I knew could erase our scheme markers pretty readily. McCabe held on valiantly but was ultimately killed. On the last activation of the game, Sensei Yu dashed into the middle to throw down another scheme marker and complete Search the Ruins. Thankfully, our opponents didn’t figure out what we were doing to stop us and so, on the last activation of the game, we got ahead by 1 VP and stole it. This would become a theme as the day went on. Which Huggy is the real one? Hint: not the one whose crew also contained a Doppelganger and 2 Changelings. Our opponents were the Autumn Nightmares, a Neverborn crew played by Sam and Kevin. Our game plan was to use Beckoners to draw the enemy across the board to us, where Hungering Darkness, Lynch, and an over-clocked Dawn Serpent could score from safety. The board was not super-cooperative in this endeavor, as we had a pretty wide open graveyard board, but there was a fence and gate on the very back edge of our deployment zone we hid behind to form our base. 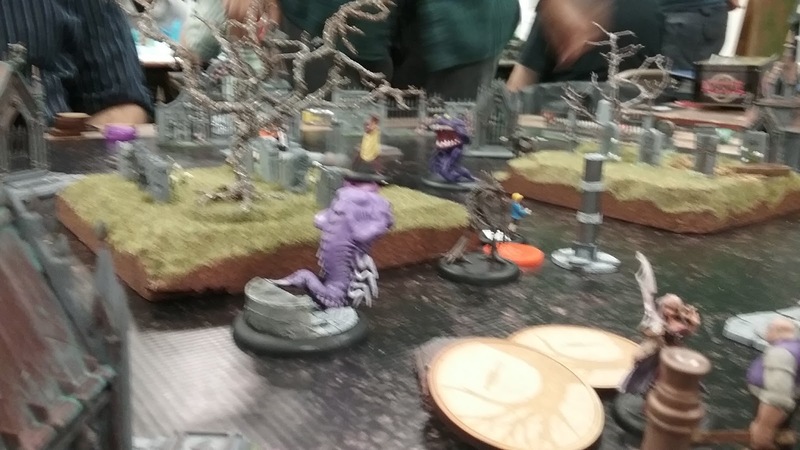 The enemy was using Neverborn flavored Lynch with some Illuminateds and Changelings paired with Lillith, McTavish, a Doppleganger, and some Waldgeists. I brought Lynch, HD, Mr. Graves for some more movement shenanigans, a Depleted, and 2 beckoners. Jon had McCabe, the Dawn Serpent, Yu, Terracotta Warrior, and a low river monk. Our schemes were Frame for Murder on the Depleted and Hunting Party. So, basically, we had a drug war on our hands. The enemy didn’t have a ton of ranged outside of McTavish, so we knew we had a good chance of making the plan work. A Waldgeist ended up in our DZ early between lures and Neverborn tricks and gave us a first opportunity to score a hunting party point, but McCabe hit it too hard and killed it himself. Ultimately, the game boiled down to a 2-sided fight, our right flank where McCabe and the Dawn Serpent tag-teamed with one of my Beckoners to draw Illuminated down and try to kill them, while our left side featured Graves, Lynch, HD, and the other Beckoner dealing with the other enemies. Our chump Depleted bravely (or foolishly?) ventured forth and was drawn into Lillith’s melee range by Tangled Shadows, but they gave me a bit of a scare by acting like they were going to kill him with an Illuminated rather than the Master herself. Thankfully, the enemy’s Hungering Darkness obligingly killed him off so we could score. 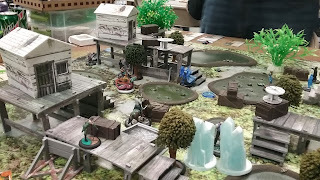 The left flank combat was a money-maker for us in terms of hunting party and Bounties, but things got a little dicey when Lillith disengaged, hopped across the board, and nearly killed Jacob Lynch after he overextended to finish off a Lured-forward McTavish. Thankfully, Mr. Graves saw what was coming and obligingly ran forward to smash Mr. Lynch’s skull in with his fence-post, thereby denying the enemy the Bounty points. This one got a little dicey at points, but between the high-value targets we took out on the left, bounty points scored by our Huggy, and the reactivated/terracotta warrior buffed Dawn Serpent picking off Illuminated, we won relatively comfortably. Round 3 Head Hunter/Corner Deployment/Undercover Entourage, Leave Your Mark, Quick Murder, Take Prisoner, Convict Labor. Against team Insert Winning Team Name Here (Ray and Jim) and their Arcanists, we thought we would go with a similar game-plan to what we used previously, tossing out the same crew list but with a Beckoner replaced by a Performer to pick up heads. We faced a very well designed crew focused around a combination of Collette and Rasputina models with Hans to cause some more ranged trouble. 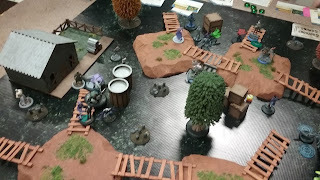 While I went to the restroom during set-up, some genius decided to make a bunch of bubbling puddles count as hazardous terrain (thanks, Jon) so the middle of the board between two buildings became a wide-open stretch of no-man’s land filled with bubbling death puddles. We didn’t have a strong feel for which schemes to take on this one (my note sheet has several options crossed off) but we settled on Take Prisoner for the opponent’s Ice Dancer and Undercover Entourage on Sensei Yu, who can cross 21 inches with our crew build when he wants. We screwed ourselves up from deployment in this one, I’m able to admit. The massive building we hid behind was impassable, and so our opponents were able to get into position while we were still trying to move around the damned thing to get to the battle. And as soon as we did start to peak our noses out, we discovered the horrible reality of our opponent’s crew: Collette’s prompt can be used on any friendly model. Including Rasputina. So our opponent effectively had 6 Rasputina AP to use every turn. Hoo boy. This is definitely one of those "The designers never thought of this format when playtesting" things. Realizing the trouble we were in, we broke up our huddle of models as quick as we could and sent the Super Serpent over the hill and back to cause some disruption in the enemy. Huggy tried to move forward to do anything productive and did manage to put some wounds on…something, but was promptly killed by Hans who could ignore his cover and his incorporeal. Lynch had moved around away from the group, dashing into a position out of LoS of the enemy ranged attacks and supporting the Depleted, who had his eye on the enemy Ice Dancer. Those two would engage and dance a lovely duet for the rest of the game, making that dumb depleted the MVP of the whole damn game as he scored us 3 VPs and blocked an opponent’s Leave Your Mark. Where we got back into the game was by using Lynch and a combination of holding all the Aces in his hand with “Wanna See a Trick” (an upgrade I had severely underrated) to make the enemy’s Coryphee duet brilliant and kill them, bringing back Huggy. The super serpent and the newly spawned Huggy managed to pummel through the super Coryphee and a Wendigo with Armor of December that ran up to block us, scoring us a head and a VP. Again it came to the last activation, as Yu had to dash for the enemy corner. He couldn’t quite make it due to some (accidentally) clutch Ice Pillar placement in his path from the enemy, so we got 2 points instead of 3. However, yet again, we snatched victory out of the jaws of defeat on the last activation…almost. We ended up with a draw at the end of the most fun game of the tournament. Our differentials weren’t high for most of the tourney, and I knew there was at least one team that went undefeated. I was very pleased, then, to find out that we had done well enough to take home 2nd place! 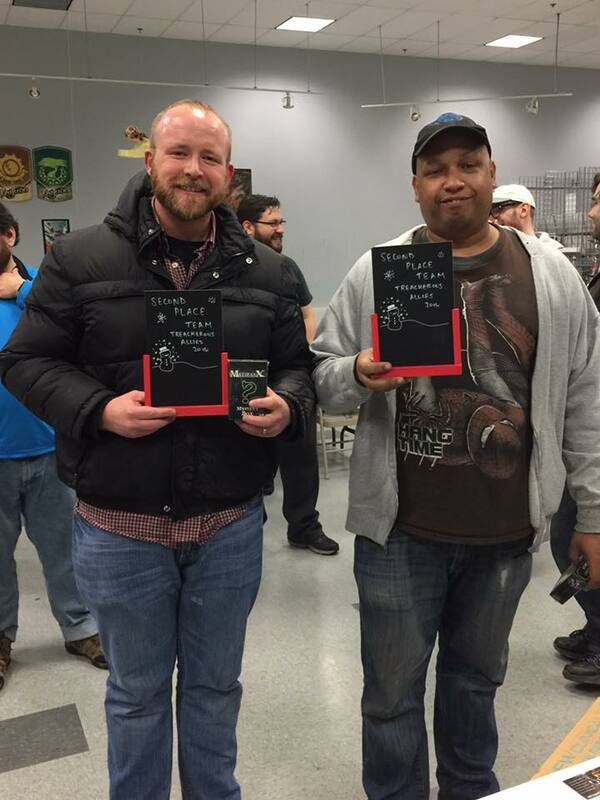 We both got small mystery boxes, and Jon won one of the Starter Boxes from the raffle, so all-in-all, a great tournament for team Malifaux Musings! Dawn even managed to shame Jon into smiling for a picture...almost.